Presonus DigiMax DP88 8-Channel A/D/A Converter With Remote Preamps For Studio 192. Condition: AN OPEN BOX ITEM. For more than a decade, DigiMax-series preamp/converters have been relied on in countless recording studios worldwide. The DigiMax DP88 is the latest innovation in the DigiMax line, offering digitally controlled, analog preamps and unmatched digital conversion up to 96 kHz. Like its predecessors, the DigiMax DP88 provides the connectivity, flexibility, and professional sound quality to make it a perfect fit in any studio environment. A smooth trip from analog to digital. The DigiMax DP88 is equipped with audiophile-grade, Burr-Brown processors to deliver top-quality digital conversion up to 96 kHz. These converters provide 118 dB of dynamic range and are backed by a boast-worthy clock with sub-50 picosecond jitter to capture complex musical harmonics smoothly and naturally. You'll hear every breath, transient, and detail of a performance in your recordings. XMAX preamps, now with remote control. The DigiMax DP88 includes eight digitally controlled, analog XMAXT preamps, each providing high headroom, low noise, wide dynamic range, and extended frequency response. The resulting musicality and transparency made this design an industry favorite. In 1995, PreSonus patented digital control over analog circuits for our first product. Building on this legacy, we created a separate digital volume-control circuit ahead of our award-winning analog XMAX preamp design, providing the convenience of digital recall without sacrificing fidelity. A natural extension for the Studio 192 Studio Command Center. Although the DigiMax DP88 is the perfect companion for any audio interface with ADAT I/O (see DP88 Benefits and Compatibility Chart), it was designed to seamlessly extend the analog I/O on the PreSonus Studio 192 studio command center. When the DP88 is connected to a Studio 192 via ADAT, its eight XMAXT analog preamps are fully remote-controllable from PreSonus' Studio One® 3 DAW and from PreSonus UC Surface control software, extending the Studio 192 analog inputs sonically and functionally. While we can't provide the same level of integration with every audio interface as we can with the Studio 192, the DigiMax DP88 is equipped with MIDI I/O for easy remote control from anywhere. By using simple MIDI CC messages to control level, phantom power, and direct ADC input, the DigiMax DP88 fits into any DAW environment. Simply connect it to your MIDI interface, enable it as a MIDI device in your DAW, and start remote controlling your preamps and recalling preamp settings with your audio sessions. Flexible I/O makes setup a snap. Flexible rear-panel I/O makes it easy to incorporate the DigiMax DP88 into any studio environment. Access the preamps using XLR or DB25 connections. Eight direct, analog-to-digital, line-level inputs are available on DB25 and can be accessed per channel with a front-panel button, allowing you to keep all of your gear connected at the same time. Eight balanced DAC outputs are provided via DB25 so you can expand your interface's outputs for monitor mixes or speaker switching. You also get eight balanced direct outputs on DB25 and eight channels of ADAT/dual SMUX optical I/O up to 96 kHz. The DigiMax DP88 provides professional sound quality and features previously unavailable in its class: Eight digitally-controlled, Class A microphone preamps; top-quality Burr-Brown converters with 118 dB of dynamic range; a boast-worthy digital clock with sub-50 picosecond jitter; and flexible connection options. Like the original DigiMax and its predecessors, the DigiMax DP88 is sure to be the new standard for eight-channel converters. 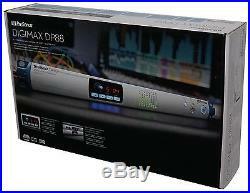 Presonus DigiMax DP88 8-Channel A/D/A Converter w/ Remote Preamps For Studio 192. Flawless analog signal path with top-quality 118 dB digital conversion. 8 digitally controlled XMAX mic preamps with individual phantom power Controlled from front panel and remotely via MIDI Controlled from UC Surface and Studio One 3 when connected to a PreSonus Studio 192. 8 balanced, direct A/D line-level inputs (DB25). 8 balanced DAC outputs (DB25) to expand your interface outputs. 8 balanced, direct outputs (DB25). 8 channels of ADAT optical I/O with 24-bit resolution and up to 96 kHz sampling rate. External clock-source select (ADAT or BNC). 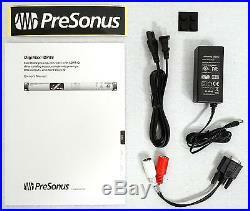 Best prices - We sell all Presonus Products at wholesale prices. Detailed information of all products. Lifetime Customer Service by Presonus product Experts. Guaranteed legitimate and authentic merchandise. Defective items: If your item is defective within the first 30 days of when it was delivered to you; you have the following options. We will send you a. To replace the item for a brand new one. Non-defective items: If you want to return your item within the first 30 days of when it was delivered to you; you have the following options. This includes blown speakers with burned voice coils. The item "Presonus DigiMax DP88 8-Channel A/D/A Converter with Remote Preamps For Studio 192" is in sale since Tuesday, February 09, 2016.